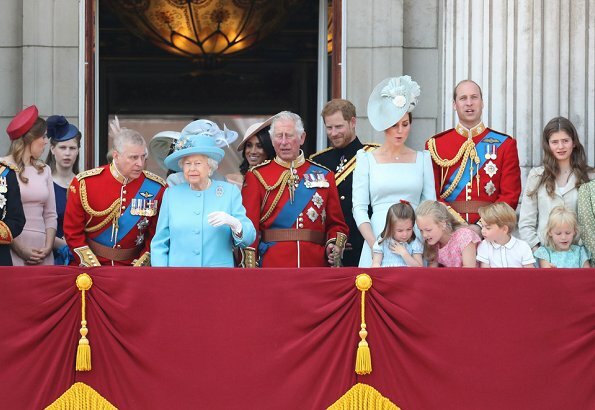 On June 9, 2018, Queen Elizabeth II, Prince Charles, Duchess Camilla of Cornwall, Duchess Catherine of Cambridge, Prince William, Prince George, Princess Charlotte, Prince Harry, Duchess Meghan of Sussex, Princess Anne, Countess Sophie of Wessex, Princess Eugenie, Princess Beatrice and Lady Louise Windsor attended the annual Trooping the Colour ceremony at the Royal Horseguards in London. The parade marks the official birthday of the Sovereign, even though the Queen's actual birthday is on April 21st. 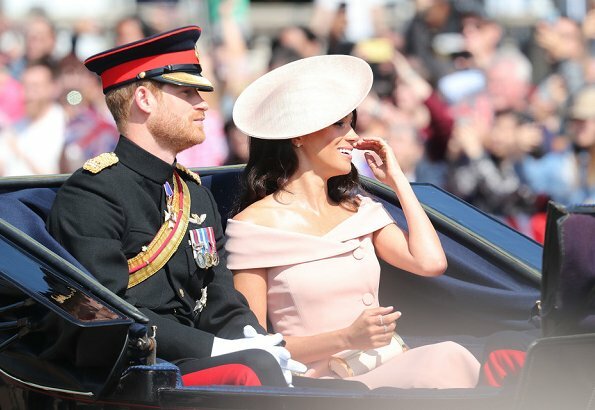 The Duchess of Sussex took part in her first ever Trooping the Colour parade today. The Duchess of Sussex is wearing a dress by Carolina Herrera. The Duchess of Cambridge is wearing a dress by Alexander McQueen. 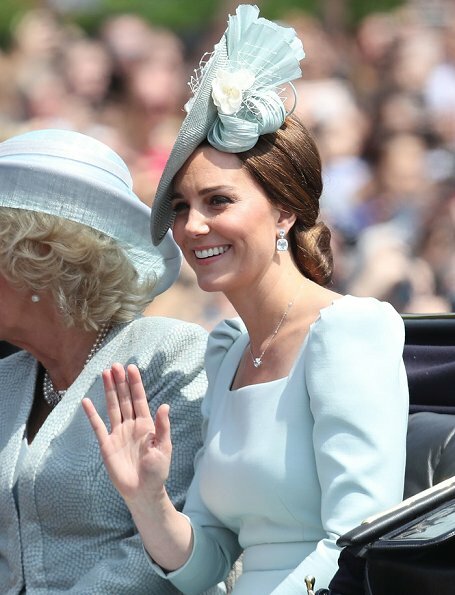 Love Catherine's hat, hair, and dress, tasteful and classy. Wish we could see more of Sophie's dress. Charlotte is wearing what all well-dressed little girls wear: smocked dress with Peter Pan collar and puffed sleeves, white socks and Mary Jane shoes. She probably owns a dozen similar dresses in different colors and fabrics. Classic European outfit... Perfect! Agree. Catherine looks absolutely wonderful! Perfection in tune to her personality a regal Look of Duchess Catherine. Love her sensitive outgoing always with humour and warmth. Meghan looks wonderful! The dress is very nice and shick. Perfect. I love her hair. I never liked Catherine's hair this way in a low bun, I think it's not flattering at all, but her dress seems to be a perfect choice, I like it a lot. As for the York sisters, I always enjoy watching them, they always make interesting fashion choices and I really enjoy it. They are never boring. Sofie and Louise are also very nice. Time flies, Louise has grown up so fast. I agree and I winder why Louise is not having braces? Am I wrong or is Meghans hat the same then in her last appereance? The York sisters and their "interesting fashion choices", ha ha! What is Eugenie having on her head? A fruit bowl? Anonymus 7.37: for me, she often is dressed too old with the hats, fascinaters and matronly looking dresses. Look to Elisabeth of Belgium and just few days before to Ingrid Alexandra of norway. Fresh young looks but not inappropriate for formal occasions. They are just young girls. Otherwise I think this Royals have a lesser rigorous court protocol than the british is. Catherine looks beautiful in this blue. Her hair is perfect style for this hat. Love the blue jeweled necklace and earrings. Hooray for Lady Louise! Finally her hair is so pretty and her little hat so sweet! Sofie´s dress is stunning, love the cut, the neckline and the color. Meghan looks fav, loving the hat. Sorry, it should be fab, I was pressing the wrong letter. It is the Queen's day and she is lovely in the teal blue. Catherine pretty in light blue, cute hat! MM 's shiny chest, whether it was oil or sweat, not great, which is why other women don't expose so much of it. Sophie pretty in pink and her daughter so grown up, pretty girl. There is no more of Meghan's chest exposed than Catherine's. 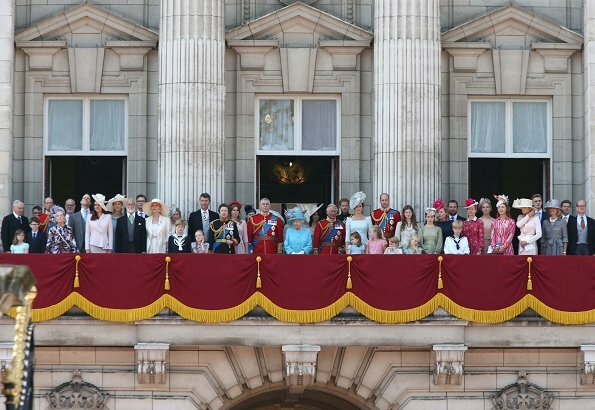 Two future queens(Camilla and Kate) in the center of the balcony waiting The Queen! YOu nailed it. Kate knows the game. MM looks a bit out of place and is dressed too young. If anyone expected Megan to be a copy of Kate, then they will be disappointed. Megan stood up for girls and women when she was very young and mostly an unknown person. Did you hear of Kate do that? Don’t expect Megan to play by the ‘rules’. Whatever you and others think that the ‘rules’ are. Megan is going to bring a different perspective to the royal family than Kate. None of them is better or worse. They should be allowed to be who they are. Wow! Stunning all of them! Catherine starts to look really regal. We can see the queen she will be. Love Meghan's shoulder part. And Sofie....is this a back cutout 😮...how deep does it go? ?😅 Not so sure about Louise, I still think there are more youthful ways to dress. 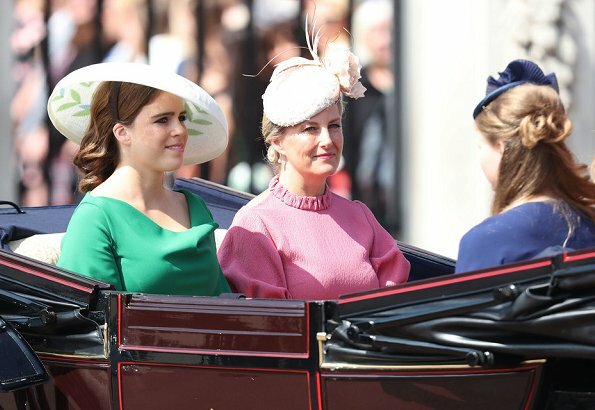 What I do not like is the pink fascinator on the right and the pink hat of Beatrice. Poor girl, she does come after her father. Off the shoulder dress? Really? The dress is beautiful, but is it appropriate for Trooping of the Colors? I am just asking. Don't remember any daring fashion choices in the past by any of the royal ladies but will have to look through past years of Trooping of the Colors to see. 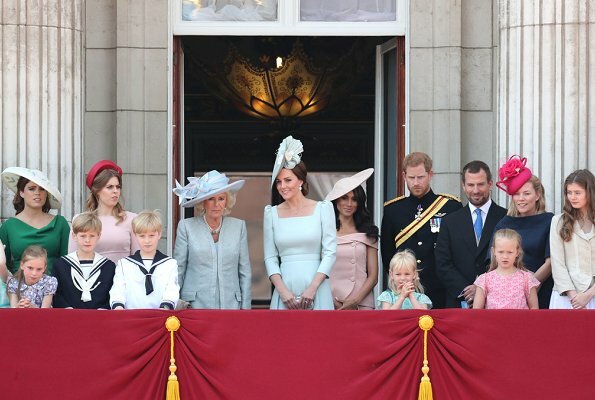 Nice to see the Duchess of Cambridge in her light blue Alexander McQueen dress. Charlotte and George are adorable as usual. I think all the other royal ladies' fashion pales in comparison to Meghan's dress, which was the whole purpose wasn't it by Meghan? I do not think the other ladies' dresses pale in comparison. But I do agree with you that the bare shoulders are not appropriate for this occasion during the day. Off the shoulder is better for evening dress. Yes, I believe it was on purpose to draw attention to herself. This day is suppose to be about the Queen. Meghan's outfit is lovely. The color is beautiful on her. The neckline is fine. It does not expose her entire shoulders. Sophie's entire upper back is exposed, which seemed odder to me. The straight horizontal neckline is one Meghan has favored in several other outfits and in her wedding dress. It shifted a bit in the carriage but she is still well covered. She was poised, serene and seemed thoroughly part of the family. The 14th photo of Catherine and Meghan looking forward is striking and showcases both of their individual beauty. Totally agree with Karen and Anon. Meghan's dress exposes too much. It is not classy for this occasion and it is attention-getting. The-drawing-attention-to-herself-expression isn´t a kind of irony because of #meto and actually all balcony-people are meant it is polarization. You can like or dislike something. You can think: This is approbiate. Much as she looks very good in her 'off the shoulder' outfit, I too wonder about the appropriateness of Meghans style choice for a military display event such as this (yes, in celebration of the Queens b'day). 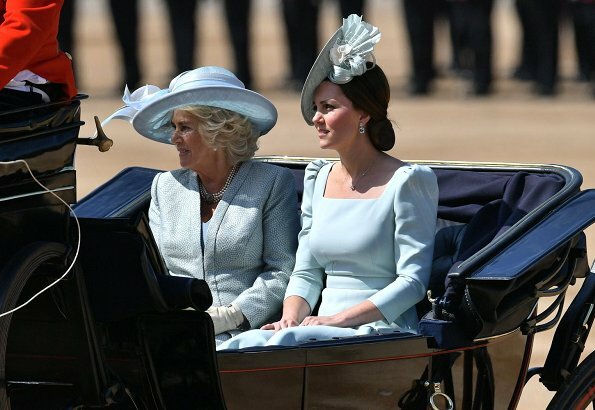 However, photos in other blogs show her at the very beginning arriving in a car before they rode in the open carriages, and there her neckline seems to be sitting quite a bit higher on her shoulders and actually looks quite fine. What this means is that obviously the shoulders are slipping as she moves - as is probably meant to do for a dress style like this - and even in these photos we can see a lot of variation. She should probably be careful or mindful about occurrences like this when choosing an outfit (even her advisors might not have considered it) for it can change the look quite considerably in seconds under the circumstances. Live and learn, I say, and better safe than sorry. I think she had the right idea in mind without the intention to offend, so no big deal this time round. The focus wasn't on her anyway. Kate looks proper regal and stunningly beautiful. I think you are right about the shoulder straps/sleeves of Meghan's dress slipping down and revealing more shoulder than was appropriate for the occasion. (At one point, one strap had slipped further down than the other, not a great look.) I'm guessing this was not intentional and will be avoided in the future. Carolina Herrera must have been thrilled that the popular new duchess chose one of her creations -- but with the world watching, probably cringed that it hadn't been fitted more carefully. With the world watching, I think they would cringe at the Countess of Wessex wearing a dress showing her back, versus the Duchess of Sussex showing the top of her shoulders. It is summer, and both women looked lovely. I think all the ladies made good fashion choices, but Catherine really stands out. Absolutely beautiful. Meghan is still learning. 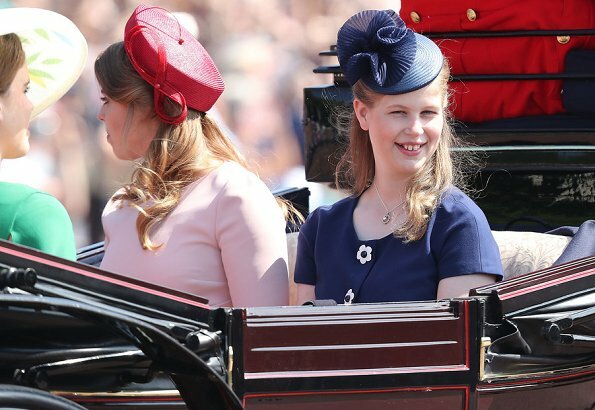 Her dress and hat are lovely, but exposed shoulders do not belong on a member of the Royal family at the Trooping of the Colors. Neither does an exposed back. However, it is summer and both women look lovely. She has. A great disappointment. I think the Duchess of Sussex is lovely, and I like her dress style. However, the Duchess of Cambridge is always the hands down winner. Very much a future Queen. It is "trooping the colours" not "trooping of the colours". There is no "of". Exactly so if she can wear that Meghan can wear an off the shoulder dress. Meghan's outfit is lovely. The palace dress code isn't as strict as everyone thinks. Catherine tends to be a little more conservative which is fine. Meghan's a different person. Her style is going to be more american. She is american, don't forget! Oh all the ladys look wonderful! I really love Kates outfit, she looks gorgeous! But everyone else is looking very good, too. So sad we don't see good pics from the dresses of the Wessex and York Girls, nowhere :-( checked dailymail and others, nothing..
Megan and Catherine look very elegant. Love the colors. 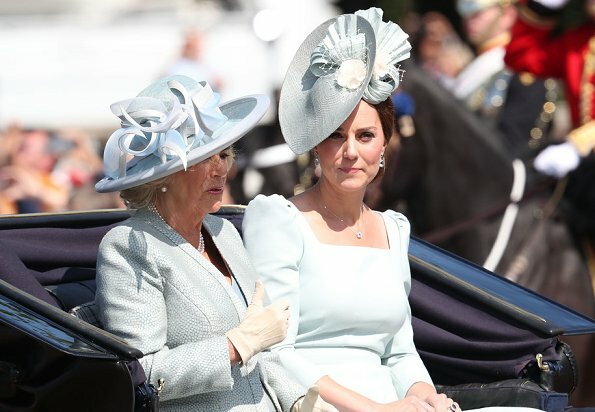 At today's event everyone looked just splendid.The light blue dress of Kate's and the hat very nice Meghan's dress id beautiful,the only thing I did not like is ,for me at least to far of the shoulders,a little less would have been perfect, maybe the hair in a bun?,it is a great color on her. 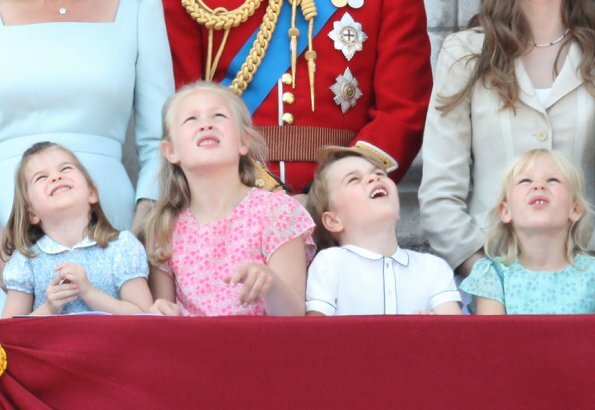 The children's reaction to the Flyby is priceless.Lady Louise looked all grown up,time really flies,just watch the children grow.The Queen is always perfect so is Camilla's blue coat and dress, I seen a little of Lady Sophie Windsor, also a super nice suit. Lets just say it everybody was looking their best. Yes. The hair in a accurate bun would have been much better, she looked like a small shy girl. Katherine looks regal and predictable, lovely simple dress, I don't like the hat, too fussy for my taste. MM looks stunning, the color suits her beautifully and it breaks the sea, along with Sophie's of more of the same. I don't know the dress protocol for this occasion, however if there is a bare back, I can't imagine how can shoulders be considered inappropriate. Other than in some religious events, It's hard for me to accept that in 2018 a western woman would have to cover her arms and shoulders. 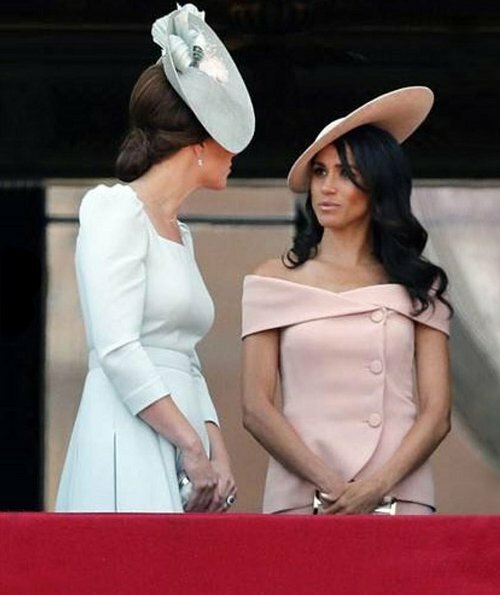 I find it perplexing that some people see a devious intent on Meghan's attire and insinuate that she is trying to upstage The Queen. 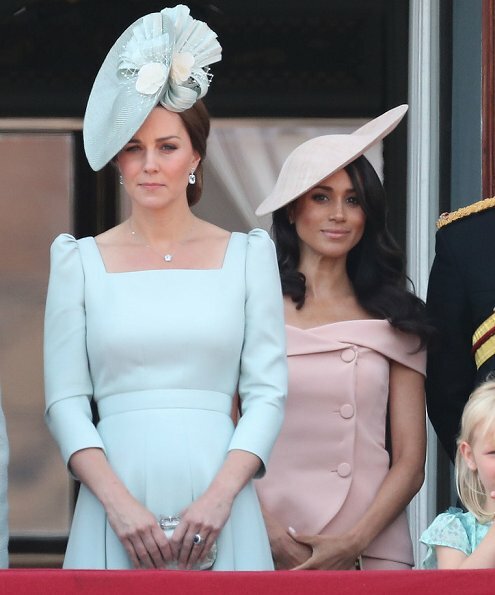 If we were to find obscure motivations, we could say that the duchess should have chosen a hat that didn't tower over the sovereign, making her the center of attention, and that would be so unfair, as I am sure that it's not the case. Some people attract attention simply because they have a quality that others don't, I think Meghan is that kind and so is Katherine, both elegant and magnetic women. Completely agree and well said. Wow!! It must be fantastic to be able to read minds and lips. Meghan is going to take some princess classes, which she badly needs. I think that all royal ladies look fabulous. Lately Sophie is seen wearing clothes that are a bit of too much for a woman her age, like this strange cutout on the back, or the jumpsuite for the evening. I do not think it looks elegant. And dresses with sleeves are also more elegant and appropriate than a cocktail-style dress when you look at all of them together out on a balcony, in my opinion. Estoy de acuerdo. El vestido de Sophie es el único que no me gusta. La tela parece rígida y pesada y ese "collar" en el cuello es feo. El resto de las damas van muy elegantes. Correct me if I'm wrong but I think Royal protocol requires the women at trooping the colour to wear sleeves and not off the shoulder dresses. I'm not a fan of Meghans dress at all. Also why did she require an almost identical hat she wore to Prince Charles birthday celebrations? Couldn't she have repeated that hat?? Sorry, but I think you're wrong. I don't think there is any such requirement - smart summer dress and hat, as might be worn to the races or a garden party. I totally agree that, apart from Her Majesty, Catherine is the outstanding star today, closely followed by the Duchesses of Cornwall and Sussex. I think the criticisms of Meghan today are a bit uncalled for. The dress is lovely----it's off the shoulder, but not at all revealing. It's a warm summer day, after all. While I agree that she looked more elegant with her hair up, she had made an effort, had it styled and got rid of the straggles. I also think it really unfair to say she was trying to steal the show form the Queen. On the contrary, she remained at the back of the balcony group. I'd agree with Cherry Blossom that if anyone appears to overshadow the Queen it is Catherine ( though I don't think it's deliberate). Sophie,s dress is disappointing--it makes her look matronly, cut out back notwithstanding-- and Louise's outfit might be worn by my 90 year old mother, apart from the skirt length. The comment that she used to be dressed very youthfully for her age but now it's the other way round is spot on. As for Charlotte, the smocked floral dresses are gorgeous and appropriate. Keep them coming. Great to see the personality of Savannah and Isla Phillips coming through. Lovely to see the Duchess of Kent make an appearance as well as the extended family who were omitted from the wedding list. For those who watched it, wasn't it brilliant to see the boy in the white sailor suit, a junior Gloucester or Kent, who was so mesmerised by the crowd that he had to be reminded that everyone else was leaving the balcony. I'm taking a break from this blog again. I'm going to say it there is an undertone here regarding MM that's very wrong that's whats inappropriste. Whatever she does is inappropriate. Nothing to say about her hair now its her dress. If not her dress, then her hair. Its not the clothes it's her that's being objected to! I agree with whoever said that Louise should have braces by now, she is definitely old enough. Super, Meghan, sehr schön. Sie bringt frischen Wind in das verstaubte Königshaus, weiter so Meghan. We all need a breath of fresh air. I`m thankfull for their wedding (Prince Harry and Meghan Markle). There is no other way on this planet as discovering love. It is not possible to overcome self-righteousness, but we have to keep up trying. AnonymousJune 10, 2018 at 7:06 PM, gute Frage. Ich weiß auch nicht, warum frischer Wind nötig sein sollte. Ich würde mich auch nicht so weit aus dem Fenster lehnen, zu behaupten, das Königshaus sei verstaubt. Vor allem weiß ich nicht, ob Meghan um die Rolle gebeten hat, die manche ihr zuschreiben. Die Arme scheint ja 'ne Projektionsfläche für alles Mögliche zu sein. Meghan magnifique! Toilette de Meghan absolument ravissante! un ton poudré quiva très bien avec son teint. Kate est belle et distinguée. As someone who often finds Catherine's clothing fine but a tad boring I have to admit I love this. The colour and style of the dress are amazing and I love her hair and hat. 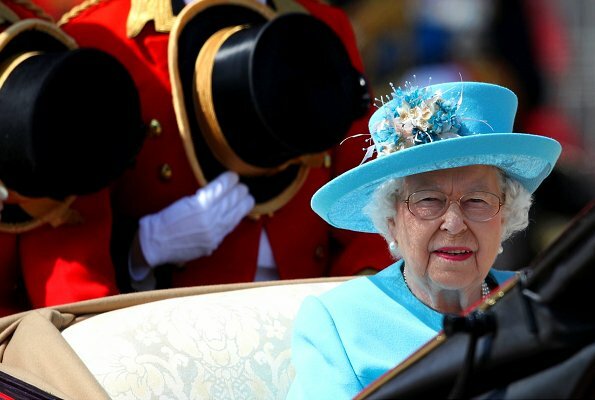 The Queen, as ever, looks great - love the blue. I also like what I can see of Camille's outfit. As to Meghan, I think she looks great - lovely colour and styling- the shoulders are fine, it's clearly a dress for a smart daytime occasion IMO. 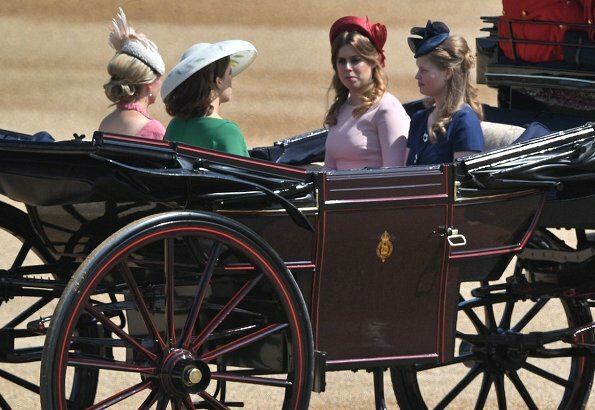 Sophie, don't like the neck bit, Lady Louise fine but a bit dull and the York sisters look ok - I like Eugenie's hat. True, it's not too low, but that outfit makes her look bulky and doesn't flatter her. I thought Meghan looked lovely today. Loved her hair make-up and adored her dress and hat. She seems to favour the more subdued colors, and simplistic designs, and it works for her. Kate as always graceful and elegant. Only seven weeks since giving birth, and she seems to have sprung back into shape ! Sophie, what was she thinking ! The dress and hat seemed to belong with different outfits. I can't imagine anyone pulling that look off ! The kids were the highlight of the show ! Good to see Prince George enjoy himself. Wish Louise could find the right look for her age. 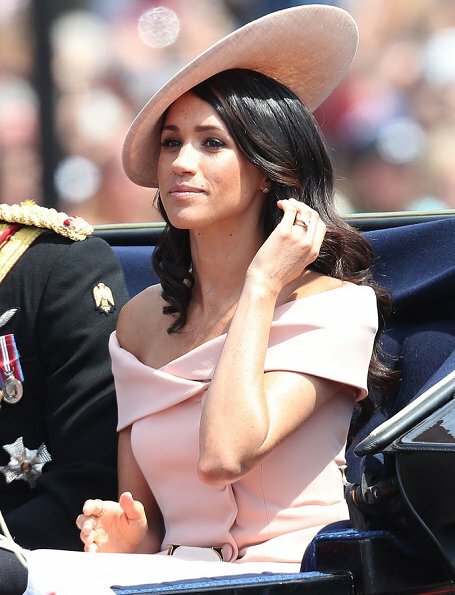 That pale pink is lovely on Meghan; so glad to see her hair parted on the side - very flattering. Love the children having fun! Muy bien toda la familia real junta. Excelente la duquesa de Cambrigde. En España, sin embargo, Felipe VI preside, sin su familia, el Festival Aéreo por el 75 aniversario de la Academia Gral del Aire. Y en España quien va a ir a verlo?? Esto era el cumpleaños de la reina, si Felipe se lo monta así, se lo comen con patatas..
El 12 de Octubre hay "cuatro y un tambor" en Colón para ver el desfile..., en España esto no tiene seguimiento.. Anonymous @ 5:47, tu siempre tirando a España por los suelos en los foros europeos , bravo!! Kate's balcony… Sie hätte ein bisschen zur Seite gehen können, aber das wird sie nicht gerne tun. Was meinen Sie? Ich verstehe die Anspielung nicht. That's what I also thought. Kate could have moved a bit to her right and share the spot, especially that scene #14 & #15 before the Queen and the Prince joined them at the balcony. Actually this is a fashion blog, but there are exceptions MM,Leonore aso. Some people who are very sensitive and who are able to analyse very clear what "stands between the lines" a kind of hidden curriculum are a bit scard of the moving "open minded welcoming attitude" which Princess Diana "loved so much". Catherine looks lovely. Her ensemble is beautiful, she really shines at Trouping of the Colour. Her ensemble is a gorgeous colour and I love that she is wearing toning jewellery. 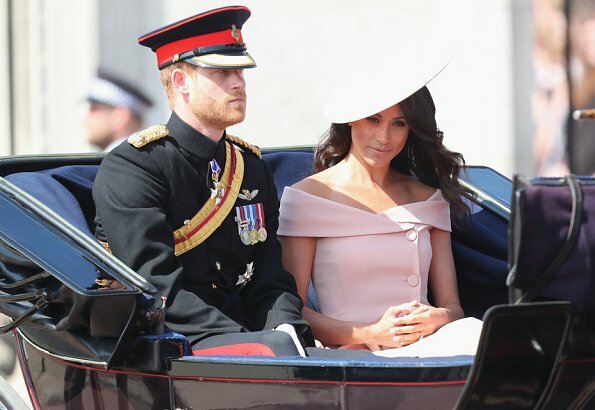 I really like Meghan's ensemble too, a very, very flattering colour and style.